Everyone keep saying you’re smart, talented and successful – so why don’t you feel like it? Without looking into it, I knew there was something about it was innately familiar. Like when you know you’ve met someone before but you can’t place a name with their face. Wikipedia was the first search result that caught my eye, so I clicked through and began to read. The “AH-HA” moment. “So that’s what they call it,” I said to myself. It was in that moment that I came to know the name of the robber of so many of my dreams, achievements and moments of happiness. I sat there for the next couple of minutes in silence; reflecting on all the things I’ve ever wanted to do in life, all the missed opportunities, and all the pain and disappointment I experienced in the name of playing small. 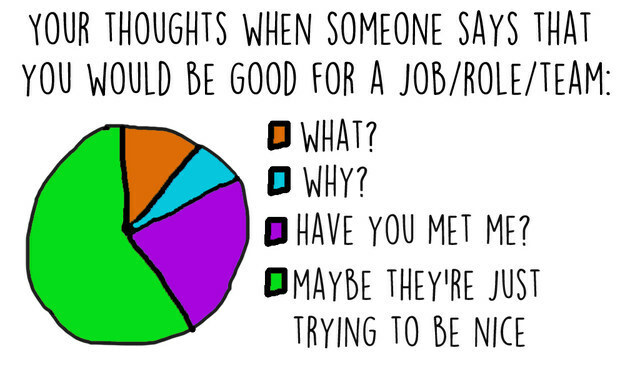 Let me tell you from first-hand experience – imposter syndrome is real. It’s a living, breathing thing and it’s cost me a lot in my lifetime. It’s probably costing you a lot too. And it’ll continue to do so until you get clear on who you are, what you’re dealing with and how to win the war going on in your mind. Now if you’re still reading this, there’s a good chance that it’s something you struggle with. 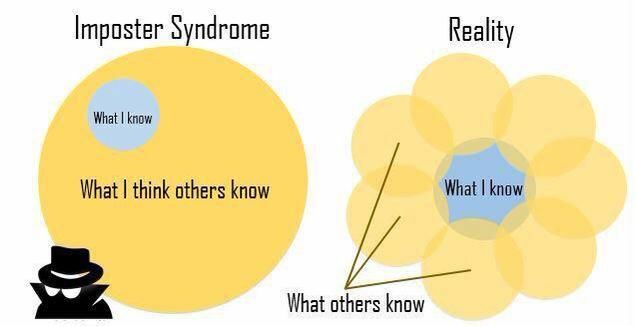 A lot of people struggle with imposter syndrome; and if you are then understand that you’re in good company because it’s usually the most brilliant among us who struggle with it. You see, it’s actually a lot more common then you think. Most people just don’t know it or have the language to describe it when sharing with others. If you’re still wondering if this applies to you, let me help you out..
People dealing with imposter syndrome always feel like they’ll be “discovered” or “outed” as incompetent or a fraud. 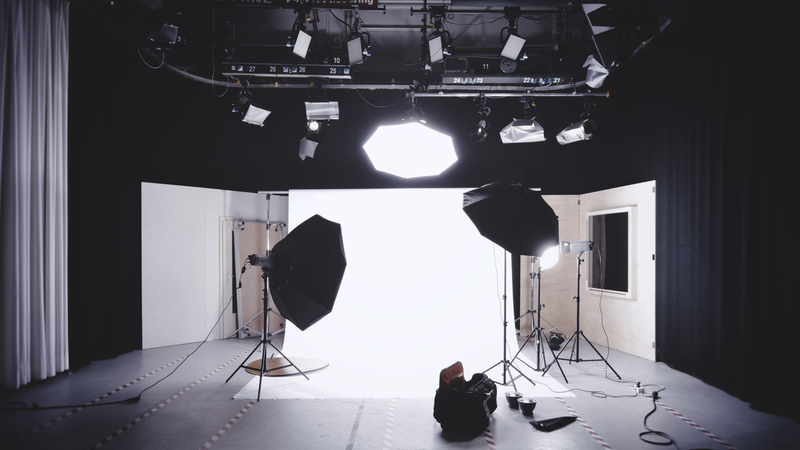 Do you downplay your ideas or minimize your accomplishments? When suffering from imposter syndrome, it’s very common to dumb it down; elevating the thoughts and ideas of others while diminishing your own. Well research also shows that people will avoid showing signs of confidence. Do you “people-please” to win the approval of others? People struggling with imposter syndrome tend to use acquiescence, perceptiveness and charm to win the approval of authority figures. This usually backfires because even in cases where people are successful in being accepted, they also experience negative feelings, believing it was the charm and not who they really are that was accepted. 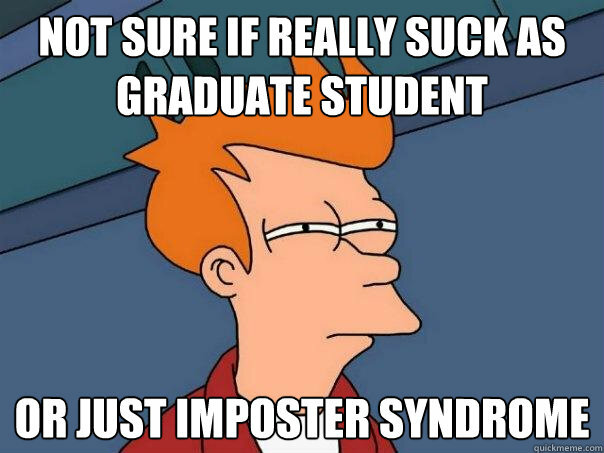 Why Is Imposter Syndrome So Difficult To Overcome? Imposter Syndrome is usually something that you develop over an extended period that’s triggered by something seemingly random. Maybe your parents put a lot of pressure on you to succeed and you feel like you’re constantly trying to live up to the “gold” standard. Or maybe it was the complete opposite, and you had someone tell you that you’d never amount to anything in life. On some level, events like this change you. Now, you’re still carrying something from the past with you into the present day. Well that’s because imposter syndrome is attached to intense experiences and deep-rooted beliefs about yourself. These experiences and beliefs shape your identity, your perspective and how you live your life. It’s not something you change overnight, especially without a high degree of self-awareness. The other thing that makes it difficult to shake is that it’s something you’ve likely been struggling with your entire life. Meaning you’ve had numerous unsuccessful attempts to overcome it. So you probably have doubts about rising above your current episode; feeling like this time you’ll be “discovered” for sure. As if the fact that you’ve made it this far in life, business or career-wise wasn’t enough evidence of your brilliance. Whenever you feel “off” it’s a good idea to pause whatever you’re doing, get still, and check in with yourself. You want to get clear on why you’re doing what you’re doing or feeling the way you’re feeling. Awareness breeds choice and choice breeds success. You can’t get control of your imposter syndrome if you haven’t locked in how it shows up in your life. Once you’ve taken a moment to check in with yourself and get clear on where you’re at, it’s of the upmost importance that you acknowledge your feelings without judgement. Acknowledging the feelings allows you to take a step in the direction of dealing with them (read: letting them go) and moving on with your life. Too often folks try to avoid the uncomfortable feelings of anxiety, fear and doubt. By doing so, you allow them to build up to the point where it becomes overwhelming. Removing judgement is a key piece here because it allows you remain neutral and deal with the issue without assigning any particular meaning to it. Usually when something happens, you attached a negative or positive charge to it, which then influences how you experience and behave in the situation. If you remove judgment, it simply becomes information. Not good, bad, right or wrong. This is where you start taking control of your imposter syndrome. If you can identity what triggers your imposter syndrome, you’re better equipped to deal with them, before it flares up. Are you triggered by having to share your work with the public? Are you triggered by preparing for a presentation, studying for a test or receiving criticism? Whatever your trigger is, you can disarm it before it starts but only if you know what it is ahead of time. Abundance is like a gift that keeps on giving. It’s a beautiful thing. Something to truly aspire to embody. Instead of thinking you aren’t enough and lacking confidence or trust in yourself, abundance would have you believe that you’re more than enough to make mistakes and still have it turn out. Abundance is trusting that you are enough in every sense of the word. That you could give it all away, lose it all today and still be enough because you are an infinite source. When you begin to truly embrace abundance, you’ll find that there won’t be any room for imposter syndrome in your life. Ever take a moment to pause and look at things from a different perspective? It’s a powerful and insightful exercise. When dealing with imposter syndrome it’s important to reframe your failures or perceived inadequacies. The idea is that a person’s perspective is dictated by the frame in which it’s viewed in, or simply put, the way they look at and understand it. When this frame is shifted or changed in any way, the thinking and behavior attached to it changes as well. So when you reframe a failure into a lesson learned, you’re taking a “negative” and turning it into a “positive”; taking something you would normally avoid and turning it into something you want to seek out. I promise it’s the best magic trick you’ll ever perform. What you need to realize about reframing is that it’s always available to you in every moment and it applies to everything. We ultimately assign things meaning, in every moment of every day. Why would you choose something that doesn’t serve you? There are times when we lose sight of who we truly are. We start having scarcity conversations and get down on ourselves. We begin to focus on our circumstances or actions. We begin to experience feelings of saddens, frustration and even hopelessness. It can be really difficult to recover from this alone, so I don’t. I have a manila envelope containing a stash of notes, cards, and other hallmarks I’ve received from others with words of gratitude and appreciation for something I’ve done or simply who I’m being. I also keep a digital file in Evernote of folks speaking to what they believe to be my gift. I know all this my sound corny but it works. Trust me when I say that it’s exactly what’s wanted and needed in a moment of hopelessness. These people are speaking life into me in moments when I’ve hit a bump in the road on my journey and need to be reminded of who I am and the impact I’ve had on the lives of others. Though my trips to the stash are few and far between, it always helps me put things back into proper perspective. Self-awareness is a major key to success. It’s important to not only become aware of how we see ourselves, but also how others see and experience us. That’s the beauty of rainy day notes. Whether your rainy day notes are physical or digital, keep it in a secure place and just refer back to it when you. It’s very easy to get the overwhelmed with your goals, especially if you’re the ambitious type. One of the things that have worked best for me and others I know or have worked with is taking one large goal and breaking it up into a few smaller ones. For example, let’s say your goal is to write a book. Instead of leaving that massive goal as it is, I would break it up into a couple smaller goals like write 1000 words a days for 30 days, send draft to editor, get the book cover designed, send to printer, host a book launch party. Did you notice how much more manageable writing a book feels when you break it down step-by-step? Take a moment right now to take that goal that you’ve been putting off and break it up into bite-sized chucks then send it to 3 friends for accountability. I recently had a meeting with a White House staffer and one of the biggest insights I learned during our conversation was just how much of what they do is done by committee. When given a task, each team member submits their work to the rest of the team for review, at which point there’s an exchange of feedback, edits and corrections. The most important thing is they know it’s part of the process, a very necessary one that they don’t take personal. They know that it’s human nature to make mistakes but that’s a liberty they don’t have because everything they work on is a matter of life or death. Are you treating the work you do like it’s life or death? And how does that look in my day-to-day life? If you’re anything like me then it’s very easy to work in a silo, only, it’s not the best or most productive way to go about our life or our work. So now I’m part of a mastermind that meets weekly via conference call. We talk about what’s working, what’s not working and what we need support with to achieve our goals. As a result, we’ve all moved the needle in a major way because we’re accountable to someone else and they’re accountable to us. I don’t know what it is but people tend to perform better when they’re accountable to others. This helps prevent feelings of inadequacy, self-doubt and fraud. Who are you accountable to and who is accountable to you? Find people that love you, respect you but aren’t impressed by you because they’ll stretch you. I believe that time feeds your fears. The more time you allow between you and your goal, the greater the chances of fear getting in your way. Be urgent and take action right away. This eliminates any opportunity for you to get in your head about all the considerations your having, both those that actually exist and the ones you’ll make up. The quicker you take action, the quicker you’ll get things done. You’ll ultimately build confidence and credibility much faster as a result. 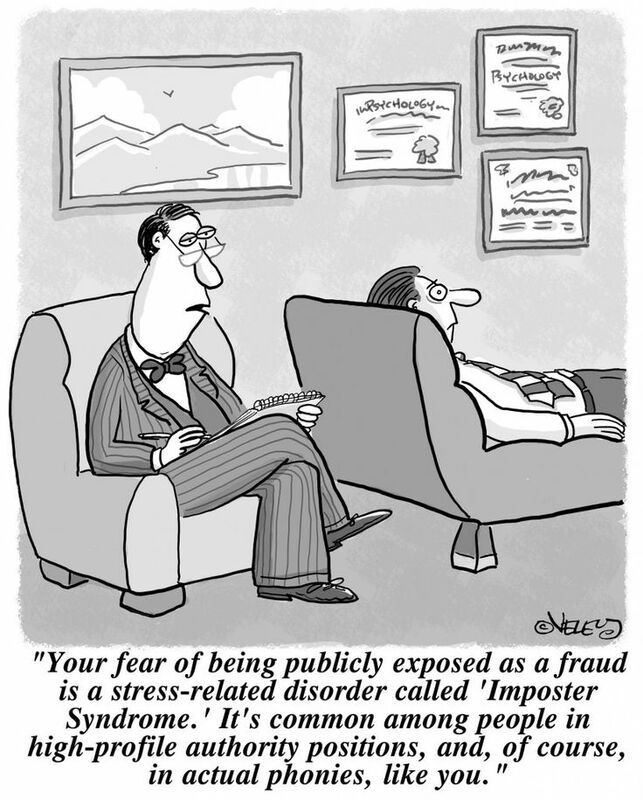 How do you plan to disarm your imposter syndrome next time it shows up?